Dealer Marketing Services, the makers of ProMax Unlimited, announced new enhancements to their software integrations with vAuto and FirstLook, two of the industry’s leading providers of Inventory Management systems. ProMax users with either integration will now have the ability to send trade-in data for appraisal, as well as import pricing data and vehicle comments, all with the click of mouse. Additionally, both integrations work in concert with ProMax’s popular new selling tool, the automated Price Drop Alert e-mail. ProMax users that also use vAuto or FirstLook for Inventory Management can now send trade-in data for appraisal with a single click. Previously, ProMax users with FirstLook had this option, but those with vAuto did not. Streamlining the appraisal process saves dealers time and money, and eliminating double data entry not only prevents mistakes, it frees up sales managers to focus on their customers. In today’s business climate, dealers need to maximize ROI on trade-ins to be successful, and ProMax gives dealers the tools to succeed. ProMax’s new enhanced integrations give users the ability to manage their inventory in one system, importing pricing data and vehicle comments from FirstLook or vAuto. This function allows dealers to update their vehicle pricing information automatically, and import vehicle comments directly to ProMax’s window sticker and powerful e-mail templates. The data import is configurable and fully integrated with ProMax dealer websites as well. In conjunction with the two enhanced integrations, ProMax recently unveiled its new automated Price Drop Alert e-mail. 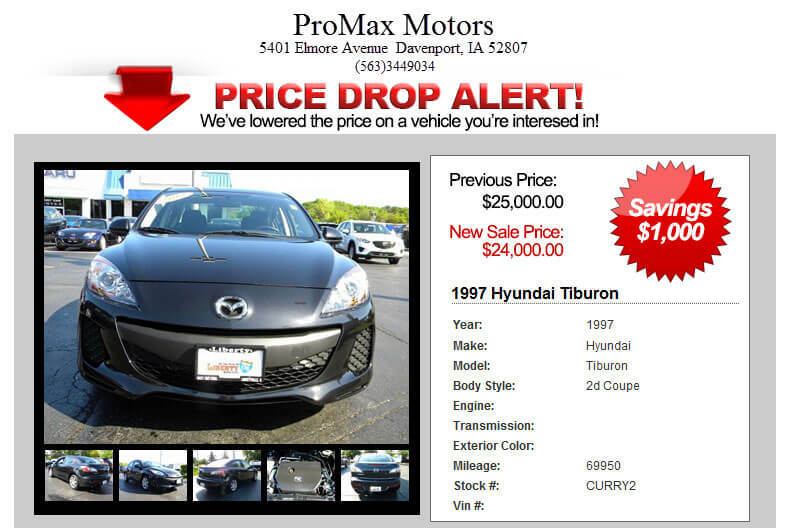 ProMax automatically generates and sends this powerful e-mail to a prospect whenever a vehicle the prospect inquired about has dropped in price. “With ProMax, we give dealers a tool to make money, not just count it” said Dealer Marketing Services CEO, John Palmer. “Our new Price Drop Alertis a big hit with dealers; it takes about a minute to set up, and it gets your unsold traffic back on the lot.” The Price Drop Alert features a large photo and thumbnails with links to larger images, plus comments imported from either Inventory Management system.